Bias is always a danger in investigations - even if it can be difficult to nail down how it takes shape. Taking many different forms, the major problem in research biases is an error in judgment - and that you often don’t even know you are making an error in judgment. “Nobody is naturally impartial,” writes Gerry Zack, CEO of the Society of Corporate Compliance and Ethics. “We have to take specific actions to ‘become’ impartial or, more accurately, offset the effects of our natural confirmation bias.” In other words, the bias is there. You just can’t see it. To counteract it, you’ll need to be proactive, putting specific tools and processes in place that reduce the bias. Whether it’s something individual like confirmation bias or something more systemic like biased collection processes (leading to information bias), the risk is to skew your research and render your conclusions invalid. Thankfully, there are investigative and research tools available to mitigate bias. You just have to choose to put them to use. Instead of focusing on the many different ways bias manifests in investigations and research, here we present three key ways that link analysis tools help reduce bias. 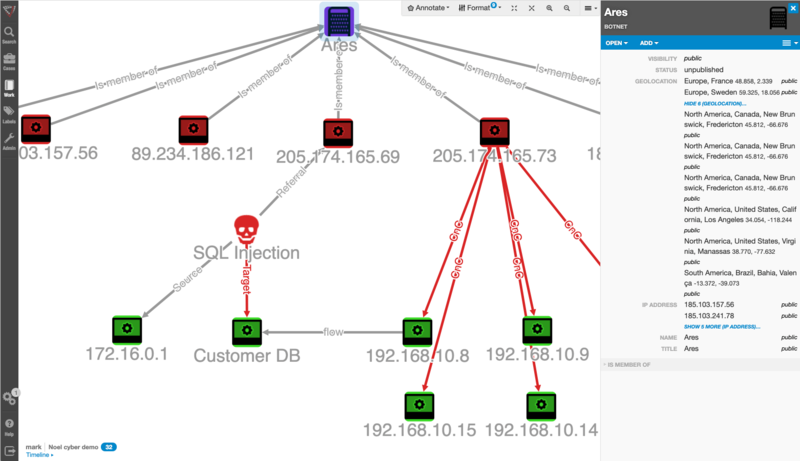 Interested in ways graph visualization can improve your investigations? Check out our videos page to see use cases, or sign up for a demo of Visallo today. One winning approach is to have multiple investigators or analysts work independently at first, , then compare and contrast conclusions once they’ve made some initial findings. Collaboration can be in-house or across multiple parties involved in the investigation. Take fraud investigation, for example. “The battle against fraud sees the involvement of various parties including issuers, acquirers, processors, card schemes, service providers and merchants, each of whom plays a different but equally important role,” writes Christian Chmiel at The Paypers. “As a result, each party possesses its own set of valuable data. More data translates into better risk assessment.” Data visualization is only as good as the underlying data, so use collaboration to get the best possible information. Real-time updates As collaborators make changes to shared data and visualizations, the dashboard should update automatically for all users. This ensures that everyone is working with the same information, immediately. Granular Access Control Everything, down to individual entity properties, can be restricted to only certain users. If some team members don’t have authority to see granular data, they can still help investigators see the bigger picture. Sandbox environment Users should be able to add, delete and modify data without affecting the open data set. This lets individuals play with ideas before running them by others. No person is an island - least of all an investigator. Smart collaboration tools help individuals see things they may otherwise not—and thus make better decisions—with the fresh perspective of collaborators. Just by being aware of the possibility of confirmation bias, you can be more careful. You can consider ambiguity, look at the ‘why’ and approach from multiple angles to avoid confirmation bias in your research. The only foolproof way to avoid confirmation bias is to impartially examine all of the data at your disposal. This is typically impossible - or at the very least impractical. Viewing data in a text-based format makes it incredibly difficult for our minds to identify patterns - and much more likely to identify patterns we already expect. Data visualization makes this full examination possible. Good data collection avoids selection bias and good data analysis avoids using information incorrectly in the initial stages of research. But data visualization helps avoid confirmation bias in the later stages of research or investigation. Visualizations, including graph, geographic, and temporal, help ameliorate this problem by spatially arranging the data in ways that are easy for the brain to digest. Data visualization tools can mitigate confirmation bias by allowing investigators to consider a much larger amount of data than they can hold in their minds at once. The mental picture helps them draw connections between data points they might have overlooked if they had to find them all on their own. Visallo’s graph Visualizations can help lead to more thorough and defensible conclusions and reduce the likelihood of bias. Pipes gives a concrete example. Say you’re tracking the origin of cell phone calls. You could calculate the average of the coordinates - which may very well end up being the city center, confirming your original suspicion. But by actually mapping the coordinates out you get a clearer visual: a lot of calls originated in the West and the East, not the city center as the midpoint. It’s a visual you wouldn’t otherwise have. If you don’t do it before, visualize your data in multiple formats to compare conclusions as a last step in your investigation or project analysis. A graph may help you understand the relationship between multiple data points, while a map gives you a real world picture of other geographic connections. A dashboard will give you a complete idea of where you’re at with the investigation, while a histogram could reveal incomplete or fraudulent data you may not have noticed before. Selection bias may drastically affect outcomes, and a visual can help you reveal if any of that initial raw data is flawed. Any system that helps you see more of the data at once will have a greater chance of exposing missing or biased data. Used the right way, a data visualization tool can both widen your view of the investigation and narrow in on the validity of the data you are working with. Just as glasses can correct myopia, data visualization can lead to a more imaginative - and therefore less biased - analysis of your data. Interested in Visallo? Contact Us to chat with the Visallo team or or schedule a demo.